Once we were out of the evacuation zone, we stopped in my friend Dana’s front yard to regroup, let the horses rest and get a drink of water. A local horse trainer who I know told me about a man further up the street with a fenced in area where we could put Prez and Berry. This time my mom took Prez, and the trainer’s son followed us in his truck. When we arrived, however, I saw the enclosure was not meant for horses. We had to go up rock steps to enter it, and inside it consisted of two levels with a steep embankment separating them. I held both horses for awhile, then ventured letting them loose, hoping they’d stay in the lower section. Instead, they ran up and Berry fell, cutting his coronary band area, luckily not too deep. We caught the horses and began brainstorming other options, calling friends of friends who might have trailers. A woman in Fallbrook offered to come get us, but only a few minutes later the Fallbrook fire began forcing evacuations, and I told her to stay and take care of her own horses. It was past midday, and my mom, who is close to 70, began feeling dizzy—a common symptom in the smoke-filled air. The people who had taken us in were very kind and sat her down inside for water and lunch, bringing me a plate and several water bottles, too. I pondered whether to ask the stable down the street to take us in, knowing it was likely the whole area would be evacuated. Are There Any Trailers Out There? Eventually it occurred to me to call the local feedstore, R Hay and Grain, and sure enough, they were coordinating horse trailers! Why didn’t I think of that sooner? They said they’d send someone right over. Soon Bonnie and Don pulled up and asked whether we wanted to go to the ranch down the street or to their house in Vista, about 15 miles away. I jumped at the chance to take the horses to fire-free Vista. By then the Del Mar Fairgrounds (where San Diego County horses were being evacuated) was full with about 2,400 horses. 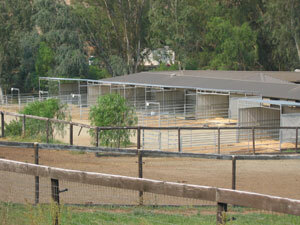 New horse staging areas were created, but most required horses to stand tied and often on cement, as there were no other locations with enough stalls or corrals. Because Prez has hind nerve damage, Bonnie had to work patiently to load him in her trailer. With a boost, he finally made it. Fortuitously Bonnie and Don had bought extra pipe panels the prior week, and we helped them assemble pens to accommodate our two horses and two other evacuated horses, in addition to Bonnie’s own two horses. 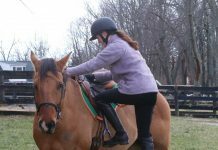 We were already learning that tragedies like these bring out the best in people, and thanks to strangers, my pony was safe. By the end of the day on Monday, all of Country Club Drive was evacuated, along with countless other neighborhoods across the county. The fires continued to grow on Tuesday, with new ones starting up. At one point on Wednesday, at least seven fires raged across the county, including three in Camp Pendleton, which practically borders my Oceanside neighborhood. The skies were gray, with ash falling continuously like dirty snowflakes, settling over everything. I spent two days glued to the TV and radio, wondering where the next evacuation order would be—taking breaks twice a day to visit Berry and Prez. Lali’s house was under continued threat until Wednesday, and on Thursday morning the evacuation order for Harmony Grove was finally lifted. 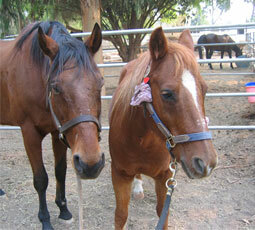 Bonnie and Don generously offered to return our horses to their home. Once they arrived, Prez and Berry carefully checked every inch of their paddock, which was now covered in fallen eucalyptus leaves. Even as I write this, the fires are not over. Already hundreds of homes have been destroyed and a half million people (and thousands of horses) are, at least temporarily, displaced. People have lost their lives, and no doubt many horses have, too. But the majority of stories, like ours, have happy endings due to the generosity of others and the valiant efforts of fire fighters. In this tragic time, all fire-stricken residents became not strangers helping strangers, but neighbors helping neighbors. What a great story–So well written that you find yourself right there in the midst of it! Thanks for including this kind of heart-warming story. After reading parts 1 & 2 of Escaping the Wildfire, I feel grateful that Ms. Myers and her horses are all okay. It was a scary time for all, but she gave me the idea of what it was like for horse owners in our county. Thanks for the article! we live in the Bonsall area and we had to evacuate over hundered head of horses, with only about 7 horse trailers during the fires in the last week. So alot of the people that helped us out and others very well now how you feel about the fires and what happened. great article, really captured the sense of threat and the way a community can pull together in a crisis. Well written article -impressed by resourcefulness of horse ‘rescuers ‘.Article reflected tone of community wildfire experience and people’s caring, kindness and wilingness to extend themselves. Thanks for writing this ! Awsome article! It really described these last weeks. Pictures helped a lot too! I loved that article. It was very well written. I an so glad that your horses were ok. I will always remember to tell all my friends with horses to get a trailer! We were out there visiting in the SanDiego area at that time. We were staying at a friend’s home, and at 3am were ordered to evacuate. It was a very upsetting experience. As we were driving down a very packed road…we did notice a couple of folks leading horses! I couldn’t help but think “wow, what would you do?”….glad to hear your story had a happy ending!. Wow, what a nightmare. I’m glad to hear you were all okay!! I just had to think…we have 3 horses and no trailer, but my friend has a trailer that lives just doubt a mile away, but they have about a dozen horses also…..I’ll definitely read all the “evacuation” and emergency things that they have here to read. Thanks for sharing.